MANILA (Reuters) - Chinese Vice Premier Wang Yang met Philippine President Rodrigo Duterte's in his home city on Friday, becoming the most high-profile visitor from Beijing since two countries long at odds sought to chart a new course in relations. Wang went to Davao City, where Duterte was mayor for 22 years before he became president in 2016 and sought a dramatic change in approach towards China at the height of a row over South China Sea sovereignty and amid the fallout of a bitter legal dispute that went to international arbitration. The vice premier signed a six-year development program to work together on trade and investment, part of Duterte's strategy to engage China as a buyer of Philippine farm and fisheries produce and a builder and financier of its much-needed infrastructure. 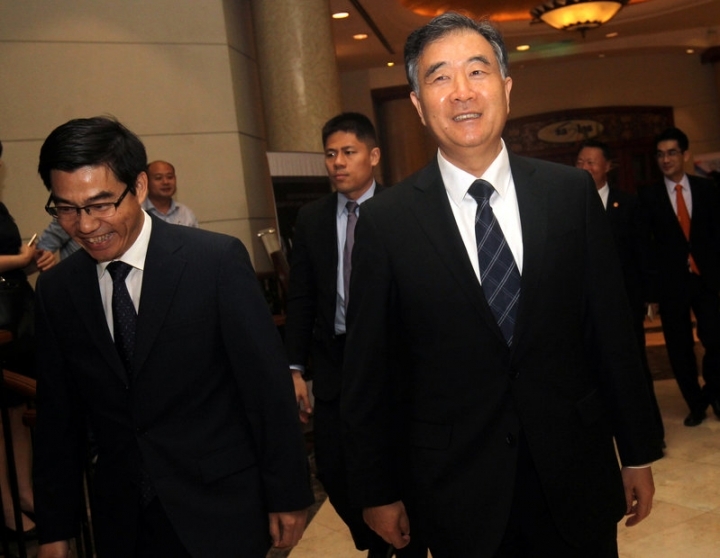 "Wang Yang noted the need to focus on common interests that bring more benefits than differences," presidential spokesman Ernesto Abella said after the closed-door meeting between Duterte and Wang. "The president said bilateral ties are found stronger, particularly in trade and commerce, and reaffirmed the importance of peaceful settlement of disputes." The relationship has for years been characterized by disputes, with the Philippines repeatedly opposing China's island-building in parts of its exclusive economic zone and its repelling of fishermen from the disputed Scarborough Shoal. Though Duterte has persuaded China to end the blockade and let fishermen operate around the shoal, China has continued to fortify some of its artificial islands with military hardware. It was unclear, however, if Wang and Duterte discussed China's decision to start preparatory work this year for an environmental monitoring station on Scarborough Shoal. The Philippines has recently said it was assured China would not carry out any building work there. The six-year business deal covers loans, support with feasibility studies, grants for bridge construction, a proposed Philippines-China industrial park, dams, railways and agribusiness training. China last week committed to finance at least three Philippine infrastructure projects worth $3.4 billion, two of which could be rolled out in the first half of this year..
Wang's visit to Davao comes two months after that of Japanese Prime Minister Shinzo Abe, who was the first foreign leader to visit the Philippines under Duterte, signaling Tokyo's intent to bolster its influence amid a changing geopolitical landscape. Abe brought with him a 1 trillion yen ($8.77 billion) aid package. 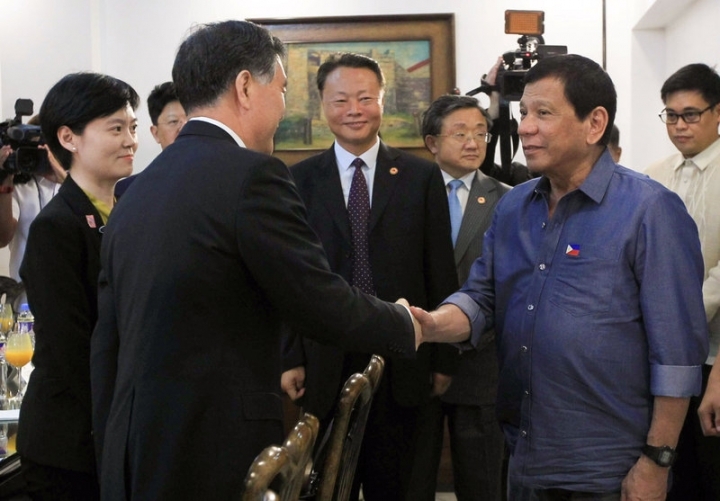 Wang's trip was more businesslike than that of Abe, who has a close personal bond with the firebrand Philippine leader and had breakfast in his humble Davao home. Duterte typically spends three days each week in Davao, or more. He is there visiting his newborn grandson, who is named "Stonefish". Duterte was also visited on Friday by Australian Foreign Minister Julie Bishop, who announced a A$90 million ($69.2 million) program to support education and policy development in Mindanao, an impoverished Muslim region in the predominantly Catholic nation. Mindanao has been plagued by decades of separatist rebellion and the Philippines is concerned it could become a hotbed of extremism if Islamic State gains a foothold. "Both underscored that terrorism and violent extremism are serious threats," spokesman Abella said of their meeting.